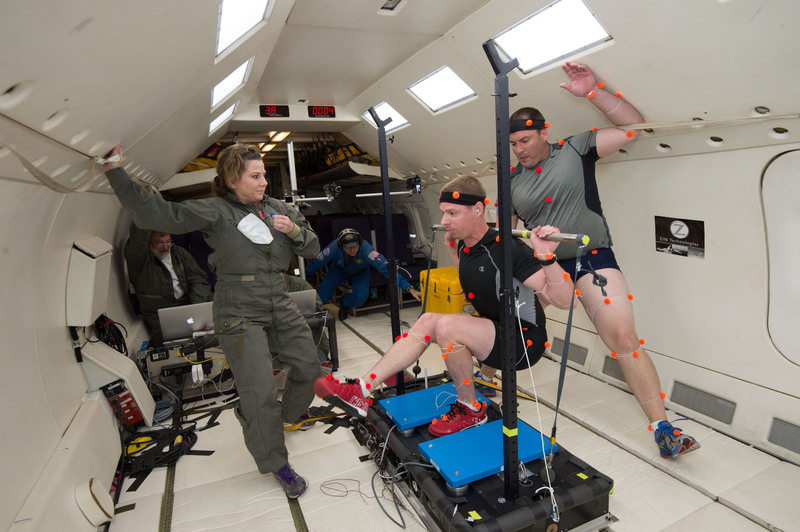 Data collection for the single-leg squat exercise performed during parabolic flight (June 2015). Pictured in foreground, from left to right: Beth Lewandowski, Douwe Bruinsma, and Justin Funk. Pictured in background, from left to right: Greg Funk and Dominic DelRosso. During extended spaceflight, astronauts who are exposed to microgravity environments for long durations experience losses in bone mass and density, as well as deficits in muscle strength and mass. Presently, astronauts perform a variety of exercises during spaceflight to maintain their musculoskeletal health. However, the exercise programs in current use are not fully effective in preventing declines in muscle and bone. This project involves the investigation of resistive exercises performed on the Hybrid Ultimate Lifting Kit (HULK) device. We are developing a musculoskeletal model of the human body that will permit the systematic evaluation of resistive exercises, with a focus on the deadlift. Variations of exercise technique such as stance width, grip width, and cadence will be examined, as will device configurations including harness used and load employed. Kinematic and dynamic analyses will be performed to determine the most helpful device configurations and exercise techniques, with the ultimate goal of developing effective exercise prescriptions that will permit astronauts to maintain their musculoskeletal health during spaceflight. Extended spaceflight missions expose astronauts to long periods of microgravity environments, which causes declines in the health of bone and muscle. Resistive exercise countermeasures need to be developed and optimized in order to allow astronauts to maintain their musculoskeletal health to the greatest degree possible during spaceflight. The work described below aims to investigate resistive exercises performed on the Hybrid Ultimate Lifting Kit (HULK) device in order to optimize the resistive exercise prescriptions given to astronauts. In particular, the deadlift exercise is an important component of any spaceflight exercise regimen, as it complements the squat to work a wide range of muscles. The deadlift is useful to strengthen the hamstrings muscles, which other resistive exercises tend to neglect; undertraining the hamstrings relative to the quadriceps can result in strength imbalances and increase the risk of injury. Therefore, this project aims to employ computational musculoskeletal modeling to investigate the deadlift exercise in order to determine the optimal exercise technique parameters and device configurations required to maintain musculoskeletal health in astronauts. #1: Develop a descriptive biomechanical model that incorporates muscles and joint kinematics for a human performing the deadlift exercise using the Hybrid Ultimate Lifting Kit (HULK) microgravity countermeasure device. Perform inverse kinematics analysis to generate kinematics of the subject-specific model. #2: Formulate and solve the equations of motion for the modeled system of a human performing the deadlift on the HULK device. Determine the generalized forces (e.g. net forces and torques) that accomplish the deadlift, and infer the forces produced by muscle groups that generate this movement. #3: Perform static optimization to resolve the calculated net joint moments into muscle forces at each time step, based on the minimization of joint angle error and magnitudes of muscle forces. #4: Perform a literature review of recorded Earth-based, 1 g joint moment and muscle force data resulting from deadlift movements. Compare the joint moments and muscle force data resulting from our model against experimental data, and based on current theory, predict how performing the deadlift exercise on the HULK device will achieve the goal of maintaining muscle health. Step 1: Collect data using human subjects performing the deadlift exercise on the HULK device. Recorded data include motion capture, electromyography (EMG), ground reaction forces, device load cell data, anthropometric measurements, and photographic and video data. Step 2: Process and reduce the data by filtering, interpolation, motion capture marker analysis, downsampling and formatting. Step 3: Create a musculoskeletal model that includes both the upper and lower body. Tailor this model to accurately capture the important features of the deadlift exercise. Step 4: Scale the musculoskeletal model so that the markers in the computational model match the experimental data. Step 5: Perform Inverse Kinematics analysis to determine the generalized coordinate values that allow the experimental motion capture markers to match the coordinate values for each time step. Step 6: Perform Inverse Dynamics analysis to determine the forces and torques at each joint that produce the deadlift movement. Step 7: Minimize Residuals: Residuals are compensatory forces that aggregate as the result of modeling. Minimizing these forces ensures an accurate model. Step 8: Perform Static Optimization to resolve the net joint moments into individual muscle forces for each time step. Step 9: Perform sensitivity analysis and create data reports: Important model parameters will be varied to determine the impact of each on the model’s performance, and summary data reports will review the findings of this project. Step 10: Verify and Validate the Model: Verify the model’s accuracy by ensuring that its implementation accurately represents the model’s conceptual description. Validate the model by determining the degree to which it accurately represents the real world. Astronauts who are exposed to microgravity environments for extended durations during spaceflight experience declines in musculoskeletal health. Similarly, elderly and disabled people can experience losses of mobility that prevent them from participating in an active lifestyle that allows them to maintain optimal musculoskeletal health. Those who lack the balance or strength required for steady gait, who are bedbound, or who otherwise cannot remain sufficiently active, face a number of risks related to such inactivity. We are studying resistive exercises that serve to benefit not only astronauts during spaceflight, but inactive earthbound individuals, as well. Our work aims to gain a solid understanding of the resistive exercise prescriptions required to maintain musculoskeletal health in the absence of gravity-based activity. Providing effective resistive exercise prescriptions for impaired earthbound individuals will help them to optimize their health despite their existing physical limitations.